A huge part of the Mac Pro revolves around its support for 4K displays. You can connect two 4K displays via Thunderbolt 2/DisplayPort, and the third 4K display over HDMI. Alternatively you can connect up to six 2560 x 1440 displays using the Thunderbolt 2 ports at the back of the machine. While the 2013 MacBook Pro with Retina Display can presently support outputting to either an 3840 x 2160 or 4096 x 2160 external panel, the maximum supported refresh rate is only 30Hz under OS X (and only 24Hz in the case of a 4096 x 2160 display). That’s acceptable for use as a video preview display, but extremely frustrating for anything else (try watching a mouse cursor animate at 30Hz). Contrary to what Apple’s own support documentation lists, these 4K resolutions at limited refresh rates are supported via both HDMI and Thunderbolt 2/DisplayPort 1.2 on the new rMBPs. To support 4K at 60Hz, you need to properly enable support for DisplayPort 1.2’s Multi-Stream Transport (MST) feature. 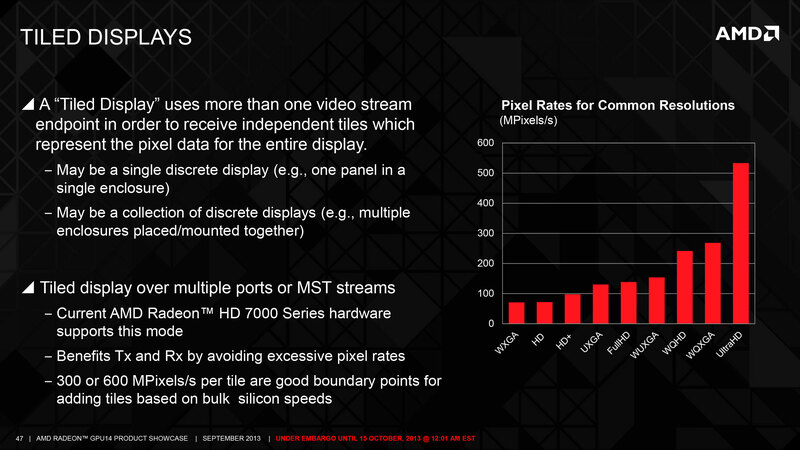 Originally conceived as a way of daisy chaining multiple displays together off of a single DP output, the current crop of 4K displays use MST to drive a single display. By sending two tiles, each behaving like a 1920 x 2160 display (one half of 3840 x 2160), you can get around the bandwidth limitations of the current crop of display hardware. Note that it is possible to drive a 4K display at 60Hz using a single DisplayPort 1.2 stream, the limitation today appears to be entirely on the monitor side. The first generation of 4K displays appear to be a bit of a hack. 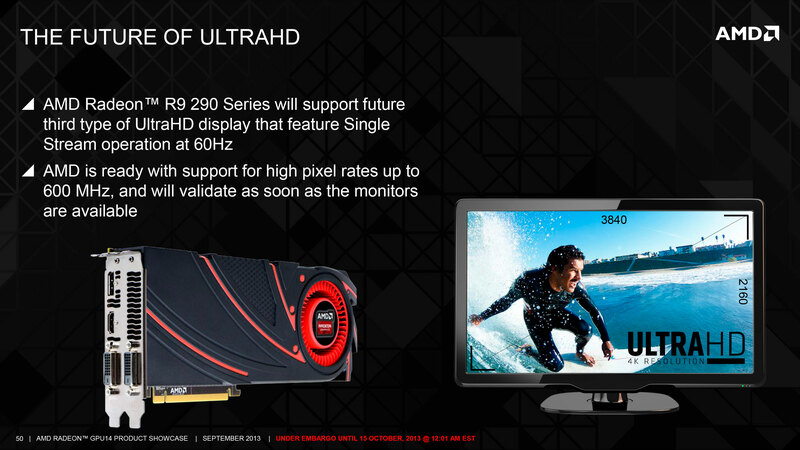 I’m not sure if the Mac Pro’s GPU hardware can drive upcoming 4K single stream panels or not as AMD specifically lists that as a feature of the new Radeon R9 series. The 4K/MST support requires a software component as well. The GPU driver needs to know how to divide its frame buffer for output to the individual tiles, which can vary between monitors. MST topologies for single-display/4K60 support aren’t standardized unfortunately. Apple handles this by maintaining some sort of a whitelist for various displays they’ve tested. The Sharp PN-K321 that Apple sells alongside the Mac Pro (as well as the ASUS clone of it) ships with 4K60 support configured out of the box. All you need to do is ensure that DisplayPort 1.2 MST is enabled on the display itself (something that appears off by default) and plug it into the Mac Pro. OS X will automatically recognize the display, configure it for 3840 x 2160 at 60Hz and you’re good to go. The same isn’t true, unfortunately, for other 4K displays on the market. Dell sent along its UltraSharp 24 Ultra HD display (UP2414Q) for this review, and unfortunately that appears to be a display that’s not supported by the Mac Pro/OS X at this point. You can get it working in SST mode at 3840 x 2160 30Hz, but forcing MST results in a 1920 x 2160 display spread across both tiles with a mess of garbled colors. Update: Apple addressed many of my 4K issues with OS X 10.9.3. For years I used a 30” 2560 x 1600 panel, but when the first wave of 27” 2560 x 1440 displays hit I was instantly hooked. I appreciated the reduction in desktop footprint and didn’t mind horribly the reduction in vertical resolution. I’m a big fan of Apple’s 27” Cinema, Thunderbolt and iMac Displays as they integrate nicely with the Mac (hooray for brightness controls on the keyboard), and I’ve grown to be ok (and maybe even prefer?) the look of the glossy cover glass. Moving to Sharp’s 32” 4K PN-K321 brought back memories of my 30” days. The display is absolutely huge. OS X (and Windows 8.1) running at 3840 x 2160 is incredible, but I find that text, menus and UI elements can be too small. My eyesight isn’t what it used to be and 3840 x 2160 on a 32” panel is just past the borderline of comfortable for me. For editing photos and videos it’s great, but for everything else the ~30% increase in pixel density was just too much. Apple actually created a solution to this problem with the MacBook Pro’s Retina Display. On a 13 or 15-inch MacBook Pro with Retina Display Apple renders the screen at full panel resolution (e.g. 2880 x 1800), but renders things like text, menus and UI elements at 4x their normal resolution (2x in each dimension). In supported apps, photos and videos are rendered at a 1:1 ratio with pixels on screen. The combination of the two results in a display that’s both incredibly high res and usable. In the case of the 15-inch MacBook Pro, you get the screen real estate (and corresponding text/widget size) of a 1440 x 900 panel, with the exception of any photo/video/other-special content that can treat the display like a full 2880 x 1800 panel. For those users who still need more screen real estate and don’t mind trading off UI element size, Apple offers scaling modes that render the screen at an even higher resolution and then scale it down to fit the 2880 x 1800 panel. For example you can select a 1920 x 1200 equivalency mode, which gets rendered at 3840 x 2400 with text/menus/UI elements at 4x res and then scaled down to 2880 x 1800. Apple even wrote their own scaling and filtering algorithms to ensure a consistent user experience regardless of what GPU was active at the time (Intel and NVIDIA scaling/filtering algorithms apparently produce slightly different quality output). I was fully expecting all of this to be available on the Mac Pro when connected to a 32” 4K display. 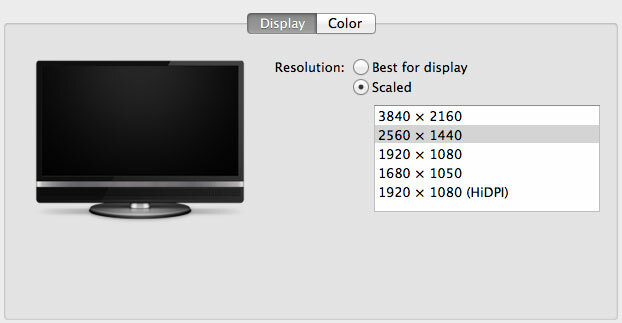 By default, there’s only a single supported scaled resolution: 2560 x 1440. Unfortunately it doesn’t look like Apple is running the same supersampling routines when you pick this resolution, instead you get a 2560 x 1440 desktop scaled up to 3840 x 2160 (rather than a 5120 x 2880 screen scaled down). The result is a bit of a blurry mess. You can use tools like SwitchResX (or Quartz Debug or the necessary Terminal command) to enable a 1080p HiDPI mode, but then you end up with insanely low point density of around 68 PPI. Unfortunately it doesn’t appear to be possible to define your own HiDPI modes in OS X, you have to rely on those that Apple officially supports. I tried creating a 5120 x 2880 (2560 x 1440 HiDPI) mode but I couldn't get it working under Mavericks. I'm not sure if I was limited by the OS or if Sharp's EDID-specified max resolution of 3840 x 2160 prevented OS X from accepting what I was trying to do. Apple tends to be very focused on controlling the user experience so it can ensure a good one. Given that Apple hasn’t yet thrown its hat into the 4K display race, it’s not surprising that we don’t have a plethora of HiDPI scaled resolutions available for 3rd party 4K displays. If Apple decides to stick to its traditional method of scaling resolution in pursuit of a desktop Retina Display I would expect to see a 27” 5120 x 2880 panel, and perhaps a 24” 3840 x 2160 option. The latter already exists in the form of Dell’s UP2414Q but my guess is Apple is waiting on panel readiness to do a 27” version before pulling the trigger. The rest of the 4K experience under OS X was pretty good. The PN-K321 display seemed far more compatible with the Mac Pro setup than the UP2414Q. Wake from sleep wasn't an issue the vast majority of the time. I did have one situation where I had to disconnect/reconnect the DisplayPort cable after the display wouldn't wake up.